The optional “Service Manager” module is configurable to match a companies requirements. Each field in the module can be named as required. Prompt for Reading – The field called ‘Reading’, by default is for when an item is serviced that has a counter like mileage or hours. If this option is selected then a work order gets a warning on save, if this field does not have an number in it. 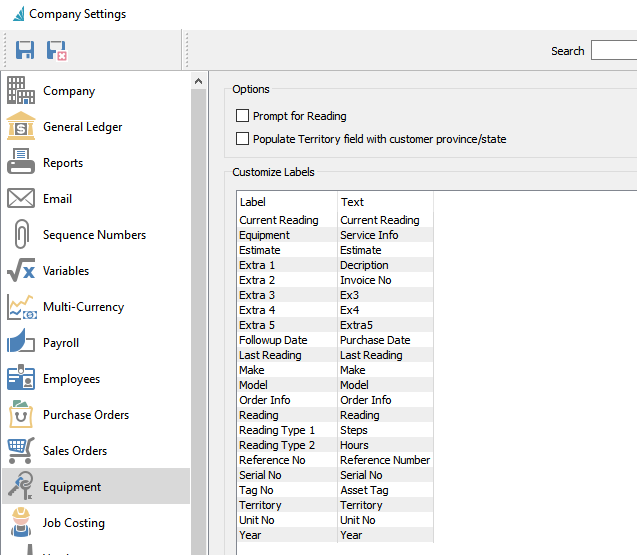 Populate Territory field with customer province/state – If selected, when a piece of equipment is added, the customers province/state gets automatically entered into territory. Text – The name that appears on screen and what is printed on default reports.